Best experience in my life! I bought a combo package boat+entrance to amnesia. I couldn’t imagine how great it will be! Seeing Roger Sanchez so close!!! Every real clubber should experience something like that! So much magical time! Amazing sound system (F1), and great working staff! Music was so great and the energy of all people!!!! This is REAL Ibiza, moments like this! Thank you all so much!!!! I will return to this amazing experience!!!! Your big fan from now!!!! Done the float your boat and glitter box combo. Can highly recommend this boat party. Been going to ibiza for the past 15 years and done many boat trips in the past. . This is by far the best boat party. Can’t wait to do it again next year. Highly recommend Float Your Boat, this ibiza boat party is not like the one we went in Bossa last year, there is no awful sticky champagne spray or childish games and with 40º at 3pm. We had the best time on Float your Boat , the sunset was amazing, the music was brilliant and our tickets included entrance to Hï ibiza. So was a overall really good experience. We hit the jackpot and got the only boat that Carl Cox was actually playing on this summer. We came from NY and NJ, USA and it was so worth the trip! The music and sunset were absolutely incredible, and the staff from Float Your Boat was extremely accommodating from boarding until we got off the boat. If I could, I would give this party more than 5 stars. We journey to Ibiza every summer, and will 100% be back on Float Your Boat next year. Thanks again! 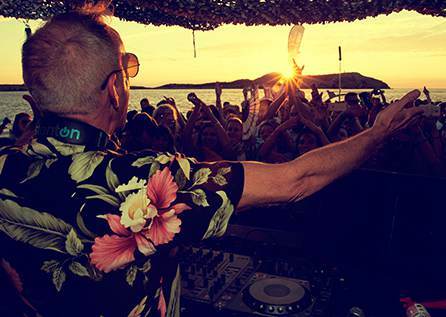 Without a doubt the best boat party on the white isle ! First class music , great bar prices and full of happy happy people!! Great music, great djs awesome afternoon!!! This is the only boat party you need, could not recommend it enough. Keep up the good work guys. See you next year!!!!! please contact us through our website. We will be happy to assist you and advise you.